Bad! Bad doggy movie. It lie down and play dead for almost one hour and twenty two minutes!. Me know, me know. ”Come on, Monster. It be a kidz movie! Turn off your brain and just settle for dis crap entertainment. Your expectashuns should be lower.” But monster ask “Why?”. 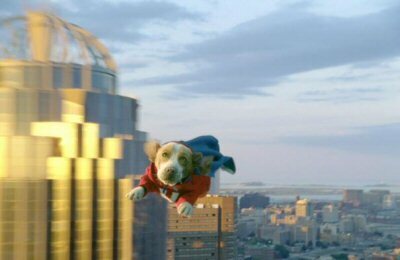 Sky High be a kidz movie and, while it not a perfekt film, it have heart and someting Underdog lack: effort. Granted, dis movie not Shark Boy and Lava Girl bad but it pretty listless, paint by numbers fare. It all feel sooooo tired. 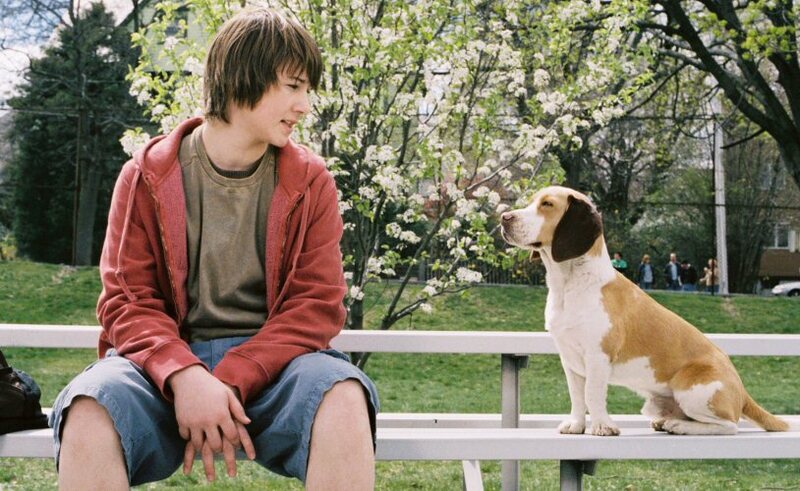 Movie begin wit our hero, a beagle, flunking out of police dog skool. Apparently, when dat happen, dey just release de dogs to run loose in de streets. Beagle get captured by goofy goon who bring him back to sekret lab where little evil scientist plan to experiment on him. 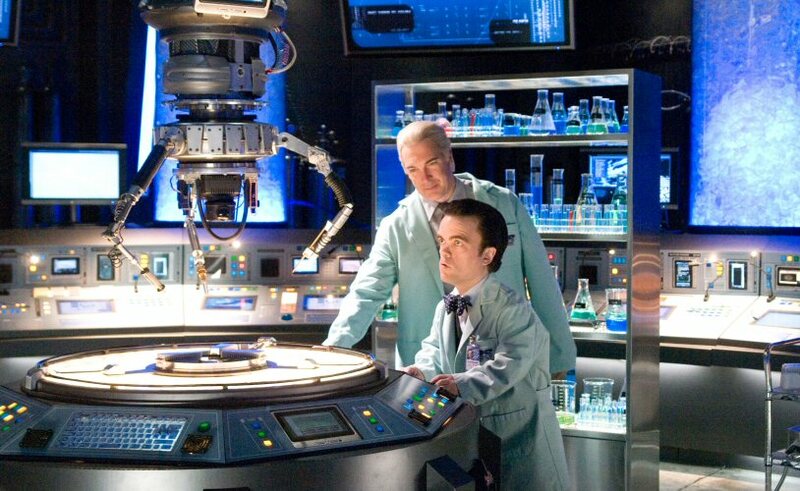 Of course, evil scientists be as unlucky as dey be smart and experiment go awry. Beagle trashes lab and gets superjuice spilled on him. He make good his escape by blasting thru door! Tyrion be a long way from King’s Landing. Outside and on de run, he hit by car driven by doofus security guard. Doofus adopt beagle, call him Shoeshine (? ), and bring him back home to whiny son. A boy and his superdog. Boy doesn’t want dog. But, of course, in true cinema cliche fashion, he come around. Espeshully when he realize dog have superpowers. And can talk! Now monster not sure why, but it seem like boy de only one who can understand dog. Mebbe. Dere be scenes where he be out and about, chatting away wit dog, while passersby pay no attention. But den dere be a scene like one where beagle see hot dog cart and yell “Hot dogs be made out of real dogs!” and people eating hot dogs spit dem back out. So, which it be? Beagle become unlikely superhero. He combat crime wit his superhearing, supersmell, superstrength, superspeed, and superflying ability. He become a media sensation! Personally, me tink just de fakt dat he can fly be good enuf to get him on Oprah. It a bird! It a plane! Nope. It a flying dog! 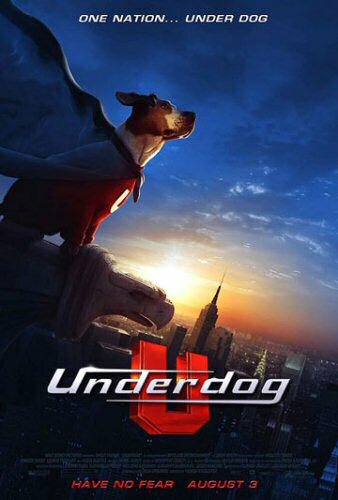 Like Clark Kent, he try to maintain a dual identity as both Shoeshine and Underdog! Not sure why. What? Are de other dogs going to rat him out? How? No one can understand dem!!! He fall in love wit King Charles Spaniel named Polly (or maybe Molly). In cute tip of hat to Superman movie, he pick her up and fly her around like Supes taking Lois for a ride. Sadly, dese types of moments few and far between. 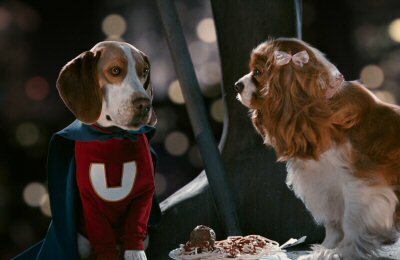 Tings looking pretty sweet for Underdog. UNTIL he be captured by evil scientist who steal back his powers and give dem to tree German Shepherds. Wit help of his accomplices, scientist kidnap mayor and take city hall where he plan to explode a bomb dat will turn everyone in de area into his slave. Oh, yeah. He built one of dose. Interesting, no? No? Not even a little? Back to his old super self, Underdog beat up on goon and scientist, den talk German Shepherds into helping him. He find bomb and dig hole to center of de Earth where it blow up. Boy rush over and pick him up. He all limp like de Count after Grover’s Pimps Up Ho’s Down party. Cue sad music. But den Underdog wake up! He be alive! Hurray! And, for some reason, doofus security guard dad becomes a hero – me guess becuz everyone in a giving mood. Movie end wit outtakes! But, sadly, even outtakes are lame – staged bits of phony aktor dog screwing up. Not one accidental onset poop! Verdikt: Our kidz deserve better. Rating: 2.5 chocolate chippee cookies.